In the USA, the number of people needing implantable cardioverter defibrillators (ICDs) has grown dramatically. Many ICD recipients will need to undergo a surgical procedure at some point following ICD implantation. Most surgeries involve the use of electrocautery. 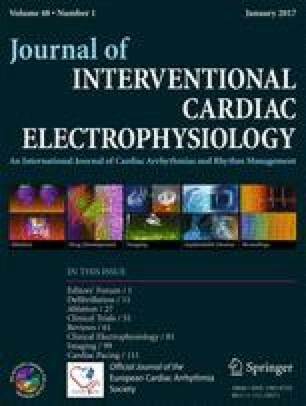 Currently, the effects of electrocautery-induced electromagnetic interference (EI-EMI) on ICDs are poorly understood. The aim of this study was to study EI-EMI using prospectively collected clinical data. We analyzed prospectively collected ICD data from patients undergoing a surgical procedure at Mayo Clinic between 2011 and 2012. Information on clinical, device history, device interrogation pre- and post-surgery, and surgical information were collected for all patients. ICDs were programmed with detections on and therapies off. The patients were then categorized into two groups: those with EI-EMI inappropriate arrhythmia detection and those without detection. The stored electrograms were reviewed. Clinical and device parameters were analyzed to identify predictors of EI-EMI. Of 103 patients studied, bipolar cautery did not induce EI-EMI (0/11 cases), whereas monopolar cautery resulted in noise detection in 11/92 procedures. Among 11 inappropriate episodes of detection, 10 had surgery at chest, neck, and upper extremity sites with cautery current across the ICD lead tip; 1 had abdominal surgery; and none had back or low extremity surgery. On average, the near-field electrogram amplitude values were greater than the far-field amplitude values. EI-EMI does not occur when bipolar cautery or monopolar cautery is used below the hips with the dispersive ground pad applied to the lower extremities. In contrast to external EMI, EI-EMI may be larger on near-field than far-field electrograms.